California Electronics Recycler has been recycling electronics in Southern California since 2009 and has grown tremendously over the past years. We are located in the heart of Orange County in the city of Santa Ana, near South Coast Metro which borders Irvine, Costa Mesa, and Newport Beach. 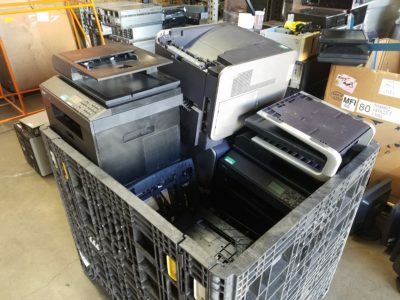 California Electronics Recycler has helped thousands of businesses and companies recycle their old and unused electronics. If you live in Southern California and need to recycle your electronics please contact us immediately, and you may qualify for a Free Pickup. With the rising amounts of e-waste America is experiencing, laws and regulations are continuously increasing. Due to these increasing regulations the necessity for electronics to be recycled properly and safely is more important now than ever before. At California Electronics Recycler, not only do we make the process of recycling your electronics quick and easy, we also abide by the laws and regulations to ensure that your electronics are properly and safely disposed. While recycling your electronics, we go above and beyond to ensure any data left on your electronics is destroyed. Using California Electronics Recycler as your professional electronics recycling partner, protects your electronics from being shipped overseas, keeps toxic materials out of the landfills, and helps collect precious metals to be reused for new products. When it comes to disposing and recycling electronics it is important to keep in mind how and where they are recycled. At California Electronics Recycler we are Eco-Ethically minded, meaning that we make every effort to prevent your electronic waste from ever being shipped overseas and disposed of through improper incineration. We attempt to re-purpose all functioning electronics but we know not all will be re-purposed and will need to be recycled as raw materials. We use downstream recyclers that ensure all materials are handled properly throughout the chain of custody. We consistently strive to use only R2 Certified recyclers as our downstream vendors. R2 vendors ensure that the materials are recycled using proper techniques that are not harmful to the environment. What makes our Southern California electronics recycling collection center different than others in the area is our Eco-Ethical methods for re-purposing and disposing of your electronics. R2 Certified vendors recycle the materials here in the United States, and we never allow your electronics to be shipped to third-world countries. We take the time to dispose of data so that it is securely destroyed and protected from any breaches that could risk your business and/or reputation. We recycle electronics for a number of different industries to recycle their electronics. Industries including: Finance and Banking, Healthcare, Defense Agencies and Contractors, Education, Government, Electronics Manufacturers, Insurance Companies, Data Centers, Electronic Retailers, Storage Facilities, Telecommunications, Software Companies, and many others. We work with a wide range of industries and know the necessary steps and protocol to handle and recycle all of your Electronics properly and securely. If you have any questions concerning recycling your electronics call us at (800) 282-3927 or fill out our contact form.